File 1099, W-2, and Affordable Care Act forms with one product. Simply drag & drop your data file into BoomTax. Verify your forms are correct. That's it! We'll send you email updates to keep you in the loop as the IRS updates the status of your submission. We walk you through every step you need to take to successfully file your information returns. 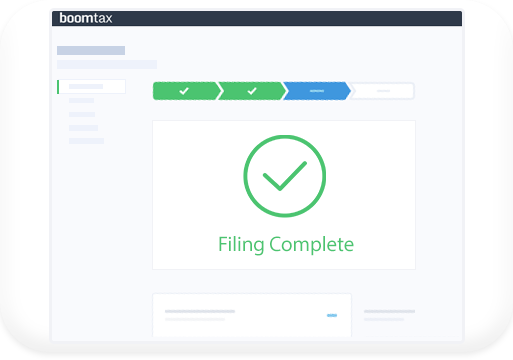 Our simple step-by-step approach allows you to easily complete your IRS reporting without having to learn any complicated software or get specialized training. We love BoomTax! We have used it for the last three years and they have been a real life saver when it comes to ACA compliance. Worth every one of 5 stars and then some! After careful research we decided to go with BoomTax for our ACA filing, and we had a flawless experience. Their online system is very user friendly and they are on top of the entire process. We highly recommend BoomTax! The customer support at Boomtax is magnificent, when you need to use it, which is hardly ever because the software works so smoothly. I highly recommend their solution to anyone who needs to comply with the ACA's form 1094 and 1095 reporting requirements. Contact us today to get a quote tailored to your business. If you are not satisfied with our product before you e-file or print your filing, we will give you a full refund.